The first black judge to have been appointed by the president to the federal bench was William Henry Hastie, whom Franklin Delano Roosevelt named as a district court judge for the U.S. Virgin Islands in 1937. Harry Truman subsequently nominated Hastie to the appeals court in 1949. Since then, the federal court system – which includes the district, appellate, international trade and Supreme courts – has become increasingly diverse, with more judges who are racial or ethnic minorities. Seven-in-ten minority judges who have served on the federal bench were appointed in the last 25 years. 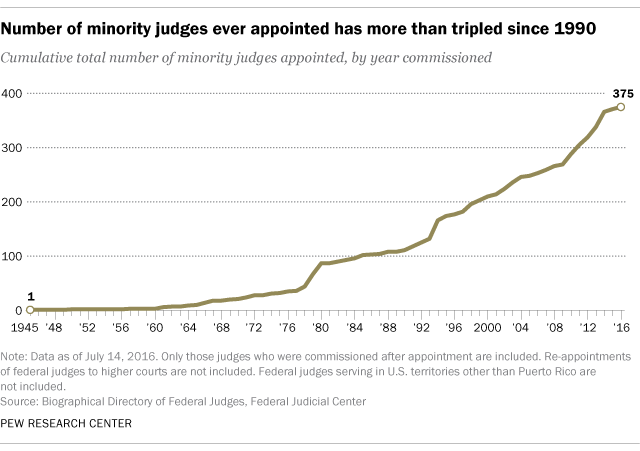 In fact, the cumulative number of minorities to have ever served in the district and appellate courts has more than tripled since 1990, according to a Pew Research Center analysis of Federal Judicial Center data for the U.S. and Puerto Rico. This growing diversity also is apparent at the federal court system’s highest level: the U.S. Supreme Court. While only three minority judges have ever served on the Supreme Court – including Thurgood Marshall (1967-1991), Clarence Thomas (1991-present), and Sonia Sotomayor (2009-present) ­– two of them are currently serving. The number of minorities named to the federal courts has increased faster under Democratic presidents than Republican presidents. From 1945 to today – a period in which Republicans and Democrats have each occupied the White House for a total of 36 years – Democratic presidents have appointed three times as many black judges as their Republican counterparts (162 vs. 49). Democrats have also named more Hispanic judges to the federal bench (73 vs. 51). Still, eight-in-ten Democratic appointees have been non-Hispanic whites, compared with nine-in-ten Republican appointees. 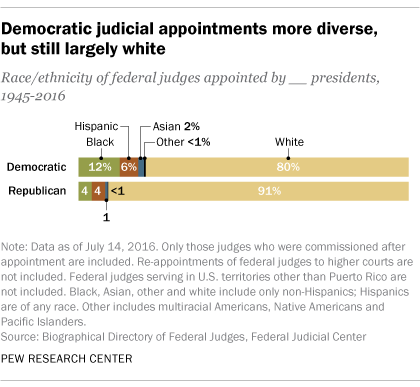 Before 2009, Republicans had appointed 10 Asian judges, while Democrats appointed six. 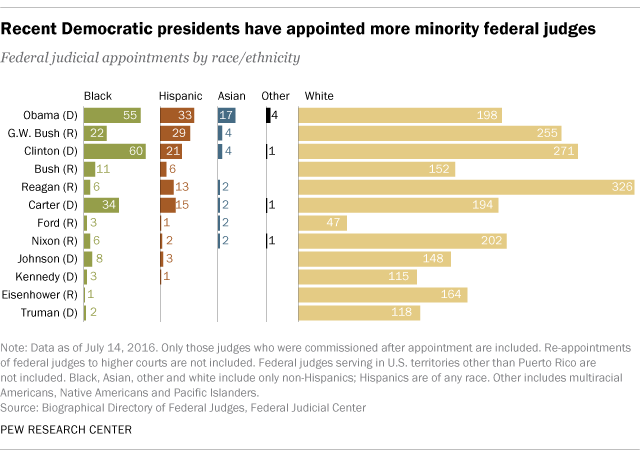 During Obama’s presidency the number of Asian federal judges greatly increased: About half (17) of the 33 Asian American judges to ever serve on the federal bench were appointed by Obama. Minorities are somewhat less likely to be represented in the nation’s 13 courts of appeals than in the 94 district courts, accounting for just 12% of appellate judges commissioned since 1945 and 15% of district judges. There has never been Native American or Pacific Islander representation in the appellate courts. Nearly half of the minority appellate judges were originally appointed to the district court and were later reappointed to a higher court. While serving in a federal court, 32 minority judges have been reappointed to a higher court. Only eight of these reappointments were made by Republican presidents. There are geographic variations in federal judicial diversity in the district courts as well. Black judges are spread across the country, serving in about 60 different districts, while Hispanic judges have served in just 29 districts, and tend to be anchored to areas with large Hispanic populations. For example, nearly half of all Hispanic judges ever to be appointed have served in districts in central California, Texas, Arizona and Puerto Rico.